Flip over tiles to reveal hidden symbols. Uncover three or more matching winning symbols to win. First, select your mode of play - Play For Fun (“Try It”) or Play For Prizes*. To play for prizes you must first enter the required code numbers from an eligible non-winning Wild Time instant game ticket. Tap on any tile to reveal a hidden symbol underneath. Match 3 or more winning symbols to win! *Actual prizes are only available in Play for Prizes mode after successfully submitting a non-winning ticket. This directive outlines a promotion by the Michigan Bureau of State Lottery (Bureau) that begins on February 4, 2014 and ends on February 1, 2021. During the promotional period, participants may access and play an interactive game through either a personal computer with an Internet connection or with a mobile device using the Michigan Lottery Wild Time mobile app. By submitting a unique Code Sequence from eligible non-cash prize winning Wild Time instant game tickets, participants may access and play the interactive game for chances to win entries into a second chance drawing or instant ticket coupons. Code Sequence - collectively, refers to either the 8-digit Validation Code or the 10-character alpha-numeric Entry Code printed on Eligible Tickets. Entry Code - the unique and randomly assigned 10-character alpha-numeric code concealed beneath the scratch-off material on Eligible Tickets from game #205 – Wild Time Series, game #223 – Platinum Wild Time, game #245 – 25th Anniversary Wild Time and game #297 - $500,000 Wild Time. Up to one (1) Extra Symbol may be revealed among the sixteen (16) Play Spots initially selected by a participant who has submitted a $10 Eligible Ticket. When revealed, this symbol allows the participant to select and reveal four (4) additional Play Spots, for a total of twenty (20) Play Spots revealed from a grid of twenty-eight (28) Play Spots. Game Number - the 3-digit number printed on the front and back of each instant game ticket. Interactive Game - the Internet and mobile-based game offered to participants in this promotion. 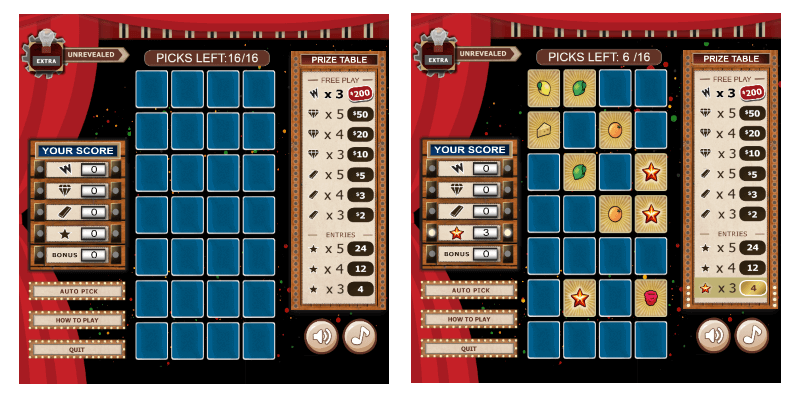 Interactive Game Outcome - the combination of Play Symbols and Multiplier Symbols revealed and the corresponding prize that is assigned to each Code Sequence. Up to three (3) Multiplier Symbols will be revealed among the Play Spots selected by a participant. Play Spot - means each of twenty-eight (28) positions in the Interactive Game play area behind which one (1) Play Symbol, Multiplier Symbol, or Extra Symbol is hidden. Play Spots are arrayed in a grid pattern measuring four (4) columns by seven (7) rows. PlayWildTime.com - the website created for this promotion that provides participants with all the functionality necessary to participate in the promotion from a personal computer. Validation Code - the unique and randomly assigned 8-digit number concealed beneath the scratch-off material of every ticket. A hyphen always appears between the third and fourth digits and the last five (5) digits are always underlined. Wild Time App - the mobile device application created for this promotion that provides participants with all the functionality necessary to participate in the promotion from a mobile device. The app is only compatible with Apple and Android devices and can be downloaded for free from each device’s respective online store. 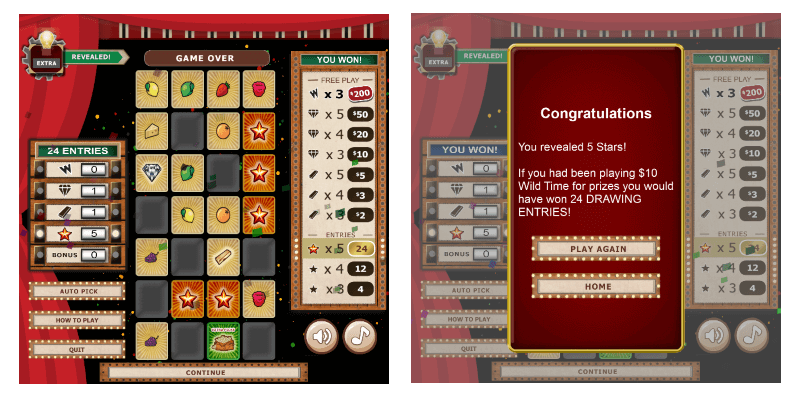 Wild Time Series – collectively, refers to the three individual ticket scenes produced for instant game #205: Wild Time Fortune, Wild Time Riches and Wild Time Jackpot. All three scenes share a common game number (205) and prize pool. By accessing www.MichiganLottery.com via a personal computer and either logging into his or her existing Michigan Lottery account or by registering as a new member, and then selecting the hyperlink specifically developed for the purpose of accessing the Interactive Game. By accessing www.playwildtime.com via a personal computer and either logging into his or her existing Michigan Lottery account or by registering as a new member. A participant will be required to have a Michigan Lottery account and submit one (1) eligible Code Sequence in order to access and play the Interactive Game. Each number sequence allows the participant to play the game one (1) time. Each Interactive Game Outcome is predetermined and governed by the Code Sequence submitted by the participant. Only Code Sequences found on Eligible Tickets will activate the Interactive game. Each participant may view the Code Sequences that he or she has submitted and the history of the prizes he or she has won, if any, by viewing the Account History screen in the Wild Time app or by logging into his or her Michigan Lottery account and accessing the appropriate page in the PlayWildTime.com promotional website. Participants may select a “Try It” version of the interactive game. Having a Michigan Lottery account and a Code Sequence is not required to access the “Try It” version of the Interactive Game. Prizes are not awarded in this version of the game. The Interactive Game play area will consist of twenty-eight (28) Play Spots arrayed in a grid pattern measuring four (4) columns by seven (7) rows. Play begins by the participant tapping or clicking any one (1) of the twenty-eight (28) Play Spots to reveal the Play Symbol, Multiplier Symbol, or Extra Symbol hidden behind. The participant continues to select Play Spots in any order until a total of sixteen (16) have been revealed. Participants who reveal an Extra Symbol will continue to select Play Spots in any order until a total of twenty (20) have been revealed. Participants who reveal a winning outcomes and one (1) or more Multiplier Symbols will receive a total prize amount equal to the prize value multiplied by the value of the highest Multiplier Symbol revealed. At the conclusion of each Interactive Game, a message will be displayed indicating that the game outcome resulted in either a non-winning experience or a prize winning experience along with the total prize amount associated with that outcome. At any time during the game, a participant may select the Auto Pick button. Selecting the Auto Pick button does not affect the Interactive Game outcome. Drawing entries awarded will be consigned to the Wild Time Second Chance Drawing and are subject to the Rules and Drawing Procedures of that contest. Instant ticket coupons awarded in this promotion will be automatically sent to the prizewinner’s email address on record in his or her Michigan Lottery account. The coupon will be in an electronic format that is printable from the prizewinner’s computer. Drawing entries awarded in this promotion will be automatically consigned to the Wild Time Second Chance Drawing. All participants must be a resident of the state of Michigan and have a Michigan Lottery account to be eligible for this promotion. An officer or employee of the Bureau or any spouse, child, brother, sister, or parent residing as a member of the same household in the principal place of abode of an officer or employee or a contractor or subcontractor of the Bureau is not eligible to participate in this promotion. Additionally, participation in the promotion must occur from within the boundaries of the state of Michigan. And, all participants must be at least 18 years of age or older. Eligible Tickets from game #223 – Platinum Wild TIme may be submitted from October 3, 2017 through May 4, 2019. Platinum Wild Time instant game tickets sold after the final entry deadline of May 4, 2019 will not be eligible for this promotion. Eligible Tickets from game #245 – 25th Anniversary Wild Time may be submitted from December 5, 2017 through December 2, 2019. 25th Anniversary Wild TIme instant game tickets sold after the final entry deadline of December 2, 2019 will not be eligible for this promotion. Eligible Tickets from game #297 – $500,000 Wild TIme may be submitted from March 5, 2019 through February 1, 2021. Platinum Wild Time instant game tickets sold after the final entry deadline of February 1, 2021 will not be eligible for this promotion.